BUFFALO, NY – The first nonstop flights between Buffalo and Los Angeles are in the books. 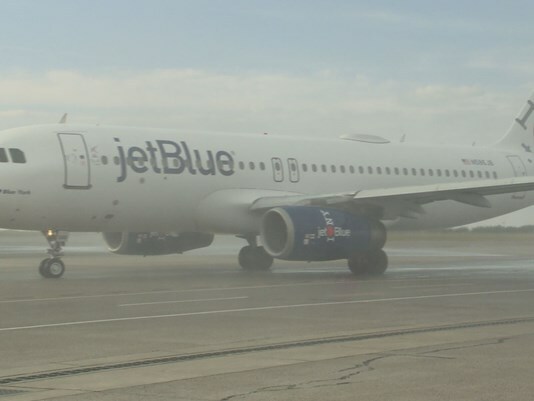 The jetBlue flights began with a departure from the Buffalo Niagara International Airport on Thursday night. After landing in L.A. that night, the flight made a red-eye return trip to Buffalo with visitors. Niagara Falls tourism officials say the nonstop flight makes it faster, easier and cheaper for our area to connect with the West Coast and beyond, because L.A. is a gateway to so many other places. The Niagara Tourism and Convention Corporation has spent the last few months building a digital marketing presence in L.A.
Over the past couple of years, Los Angeles has been one of the top five cities in the country when it comes to inquiries about vacationing in the Falls. Niagara tourism officials presented that info to jetBlue during a years-long process of trying to get this nonstop flight. They are excited about the new opportunity that will come with these new flights, and what lies ahead.